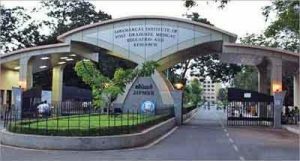 Puducherry: Jawaharlal Institute of Postgraduate Medical Education & Research (JIPMER), Puducherry has collected the Best Hospital hospital award in the Medical College Non Metro category at India Healthcare Awards 2015-16. Dr. Subhash Chandra Parija, Director, JIPMER and Dr.J.Balachander, Medical Superintendent, JIPMER received the Award from Dr. Bindeshwar Pathak, Founder, Sulabh International at a function in Mumbai on August 30. This is the second consecutive year that JIPMER has been receiving the India Healthcare Award. Dr Parija said that this is the second award this year for JIPMER, where JIPMER has already received a special award of appreciation from Ministry of Health and Family Welfare under Kayakalp Awards. According to a statement here, India Healthcare Awards jointly instituted by CNBC TV18 & ICICI Lombard now in its sixth year, is an independently judged distinction of excellence, picked by an Eminent Jury drawn from Healthcare Industry. The statement said JIPMER was shortlisted among other two hospitals in India for the Final round based on: Scope of service such as number of patients treated, number of doctors and nurses, medical specializations offered and variety of procedures performed. Infrastructure such as number of general and special wards, number of beds, ambulances, ICU capacity, number of operating theaters, Patient Safety Record such as steps taken to improve safety, average stint in the hospital, mortality rate & infection rate, Innovation and Research such as research conducted, Awards won, technical certifications, memberships & participation in conferences, number of active clinic trials, disease management program which helped shortlist the India’s finest healthcare providers for the final round. Collectively, the consumer ratings and doctors’ ratings on facility assessment data were shared with the Jury to arrive at the Overall Best Hospital Award as well as awardees in other categories. It is understood that about 4000 institutions competed for the awards in various categories. It is the best medical college. I worked 9 years there reaseach work done is excellent. staff is very co-operative. sincere and punctual.